It makes sense that you would oil the vegetables to keep all the juices inside and prevent them from drying out. After all, dried fruit and vegetables are made by slowly dehydrating (the juices out of) them. A little bit of oil creates a barrier that prevents the natural juices from evaporating as the vegetables cook and the oil promotes caramelization, a.k.a. those great grill marks. This is important because grill marks equal flavor, and a juicy vegetable is much tastier than a dried-out one. Grilled vegetables are good all on their own, but they are even better with a great Romesco sauce to drizzle over them or dip them into. 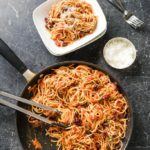 Romesco sauce is a red pepper, almond and tomato sauce that hails from the Catalonia part Spain where it was originally served with seafood and charred onions. Romesco is gaining popularity in the states and I have seen it served with just about everything. It is my favorite summer condiment and I use it to dress up grilled shrimp, fish, poultry, meat and all manner of vegetables. My version calls for fireroasted tomatoes and one large roasted red pepper, so it is more tomatoe-y than pepper-y which is my preference. If you prefer the taste of red peppers to tomatoes, switch the ratios and use 1/2 the amount of tomato that I call for and double the red peppers. 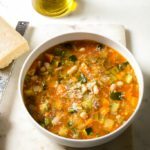 I don’t not use the bread which is in the classic recipe to thicken the sauce because I don’t want to muddle the pure vegetable and roasted garlic flavor, and I like a looser texture. 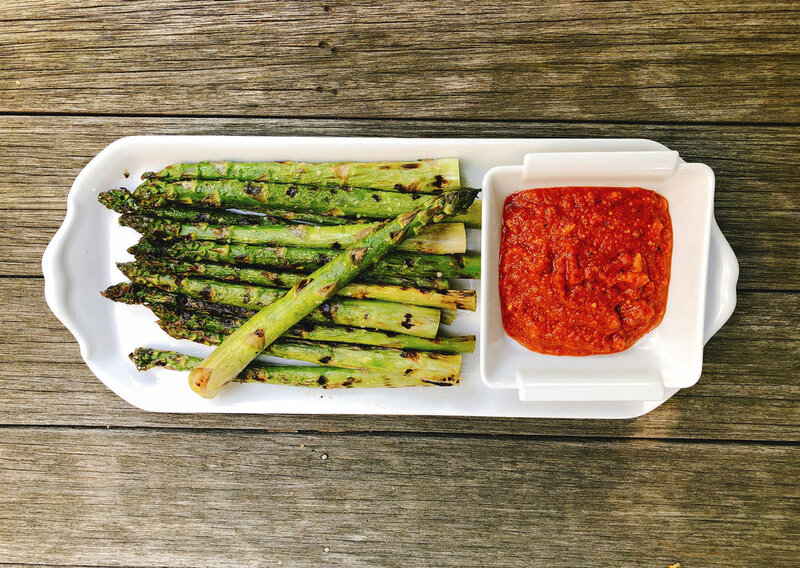 Grilled asparagus and Romesco is my favorite combination. And, this time of year, asparagus abounds. 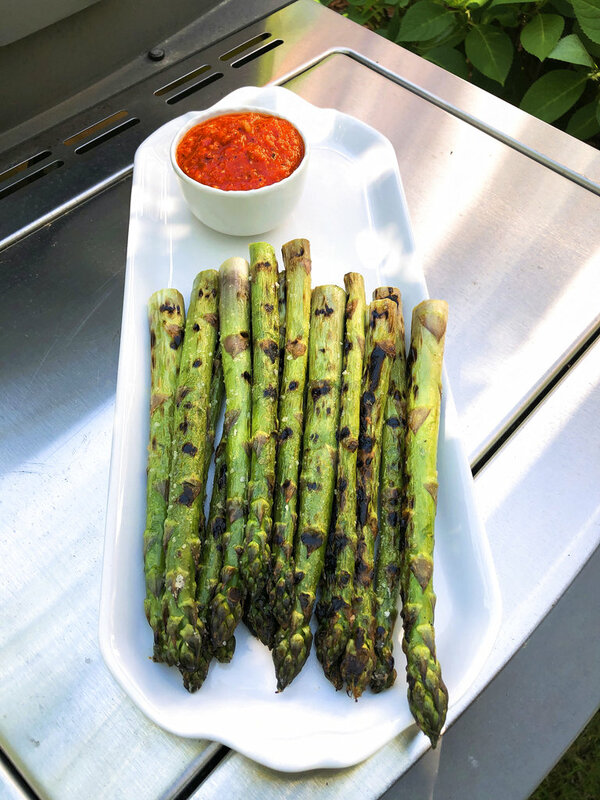 So, the recipe that I am featuring is for Grilled Asparagus with Fire-Roasted Romesco Sauce but you can use the same basic principle for any quick-cooking vegetable. Just remember to place the vegetables horizontally across the cooking grates so you get maximum grill marks and they won’t fall through the grates. If you place them parallel to the grates, it will be easy for them to slip through and fall through the grates, and that would be a pity! Grilled asparagus is my favorite, but don’t stop there. Charred whole scallions, zucchini, yellow squash, roasted cauliflower, potatoes and mushrooms are all better for a bit of Romesco sauce. 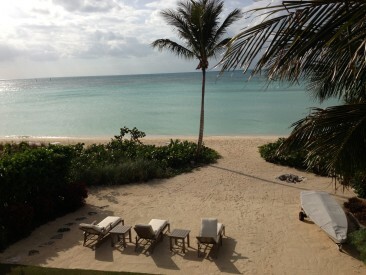 It’s all good. Throw in some grilled bread and it’s great! Rinse asparagus and snap or cut off bottom. Place asparagus in a re-sealable plastic bag and drizzle just enough oil in the bag to coat all the spears. Seal bag and turn spears to coat evenly in the bag. Sprinkle with salt, reseal bag and turn again to evenly distribute the salt. Place asparagus on the cooking grate over direct heat for 3-5 minutes or until marked and caramelized. Turn spears occasionally to grill each side. 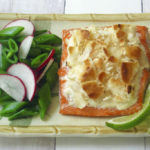 Asparagus should begin to brown in spots (this indicates that the natural sugars are caramelizing) but should not char. Remove from grill and serve immediately with Romesco sauce. Wash and dry tomatoes. Cut out the core and drizzle the center of each tomato with olive oil and season with salt and pepper. Place in a disposable aluminum tray and place in the center of the cooking grate. 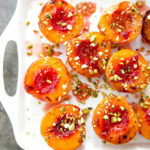 Grill-roast for 30-45 minutes or until tomatoes are caramelized and soft. (Note, this is also a good time to roast the pepper and the garlic the pepper will take about 15 minutes and the garlic will take about 45 minutes.) Remove from grill and let cool in the pan, making sure to keep any of the juices that escaped. Rinse and dry pepper. Grill over high direct heat, turning until skin blackens and blisters all over. Remove from grill and immediately put in a paper bag or sealed plastic container until cool. Note: the steam will loosen the skin from the flesh of the pepper. Skin and seed the pepper (the skin will slip off easily). Use as directed in recipe. Remove first layer of papery skin from garlic. Slice off top 1/2-inch from pointy top. Drizzle with olive oil and sprinkle with salt. Wrap in foil and cook on grill over medium-high indirect for 40 minutes or until cloves are golden-brown and soft. Alternatively, place in a 350 F oven. Remove from grill or oven and let cool. Follow recipe instructions. Nutrition information per serving: 52 calories; 40 calories from fat; 4 g fat (1 g saturated; 0 g trans fats); 0 mg cholesterol; 122 mg sodium; 3 g carbohydrate; 1 g fiber; 1 g sugar; 1 g protein. 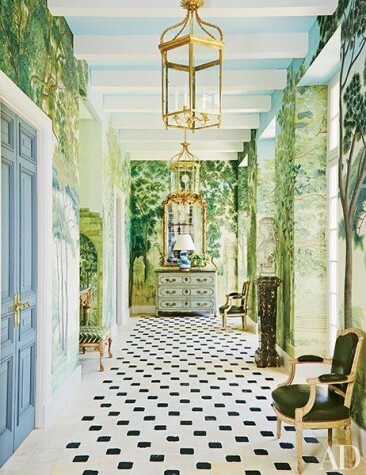 Seen and Heard: My Travel to the Albany Bahamas, Lonny Mag, Loehmann’s is Closing, Super Cool Sony Smartphone Lens, Another Fabulous Paule Marrot Print and Jean-Georges Opens in Westchester!